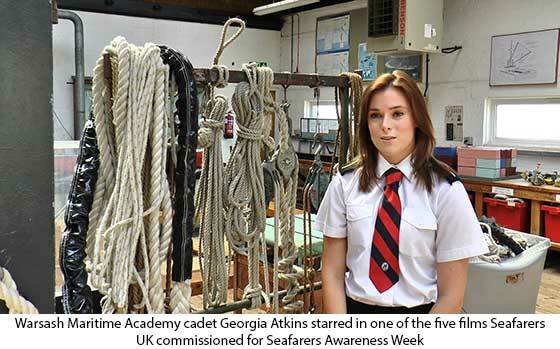 Last week saw a surge of activities around the UK during Seafarers Awareness Week; combining many events and media opportunities, with participants working together to raise the profile of seafaring and maritime jobs to the public - particularly young people, parents and educators. With the theme ‘Opportunities to Work at Sea', this year's event aimed to not only raise awareness of Britain's dependence on seafarers, but also to highlight the many career possibilities the maritime world offers young people. Involving eight strategic partners, plus more than one hundred maritime industry associations, employers, training providers and recruitment organisations, the week saw the industry come together to create a great careers awareness showcase. Seafarers Awareness Week created a huge buzz on social media, kicking off with a live Q&A session on maritime careers, with key industry experts and training colleges answering questions and giving advice to young participants. Additionally, many companies, organisations and individuals posted and shared stories during the week using the hashtag #seafarersweek, which kept the social media activity extremely lively. Facebook and Twitter usage is still growing daily, both exceeding 5,000 followers, alongside an extensive Flickr photo gallery. Keeping up the Q&A theme, the Seafarers Awareness Week team interviewed a wide range of people about their careers and thoughts on opportunities to work at sea, all of whom provided a fascinating insight into their maritime journeys. Who would have thought that the Royal Navy's First Sea Lord, Admiral Sir George Zambellas, started as an apprentice?! Supporters were also encouraged to create news stories on their websites, getting local press and radio coverage of activities and celebrations. Working with careers publications and websites, the Seafarers UK infographic (http://bit.ly/1BQntd5) was also shared by Jobsite and other career sites, reaching a far wider audience than ever before. Many maritime related events were also held during the week: conferences, Warsash Maritime Academy open day, charity abseils and dinners - with the climax of the week being the International Day of the Seafarer on 25th June. 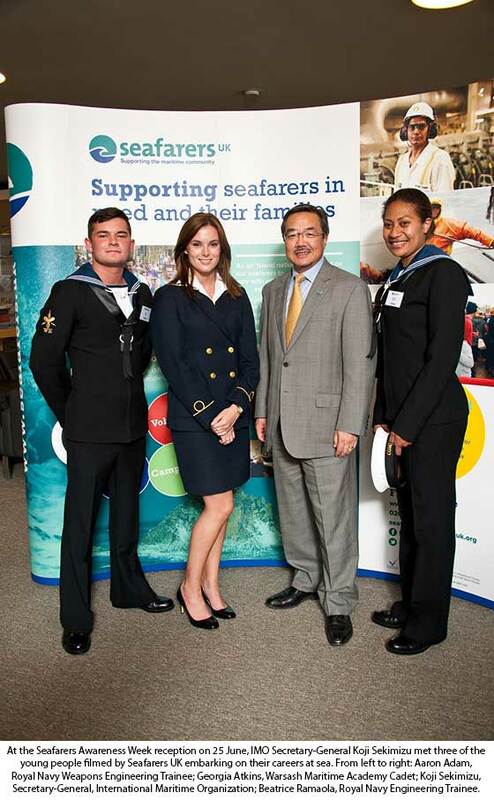 On 25th June, Seafarers UK held a reception, kindly sponsored by Inmarsat Global, at the International Maritime Organization's HQ in London, as the highlight of the Seafarers Awareness Week activities. Attended by Koji Sekimizu, IMO Secretary-General, the event attracted over 150 top industry guests, who experienced the launch of a series of specially commissioned short films, which follow the early training experiences of several young people at sea (http://bit.ly/1LxM3Sh ). This was followed by the unveiling of the Seavision Career Navigator portal, a new website designed to host career information and guidance for those seeking the whole picture of maritime job opportunities at sea and ashore.